It was captivating, couldn't stop readn till I finished the whole book. Loved this book. Oncec I started reading it was hard to put down. Good characters and interesting twists. These two writers a a great team. I loved this book as much as I've loved the others in this series. Gus and Roman make my heart melt and my eyes tear, the passion and love between them is a thing of beauty..and frustration. I can't wait for the next chaperone of this story and all the secrets and answers that will come with it! 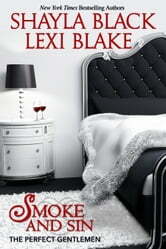 Heart stopping, smoking hot and beautifully written. I loved Gus! As usual, these ladies hit it out of the park !! The Next great chapter in the Perfect Gentlemen saga. There’s love, intrigue, spies, murder and always a well woven story to keep us wondering to the end. And the best kept secret that wasn’t is revealed in the end. Loved it ! !